Photo courtesy Westminster Historical Society, with image editing by Bob Ash. A month ago, longtime Westminsterite Chris Garland asked me about the Green Kat Café. This led me to discover TWO convoluted tales that turned out to be part of the same story. My previous green-feline-related post actually intertwines with the following tale, although that tale was set in Santa Ana and this one takes place in Westminster. 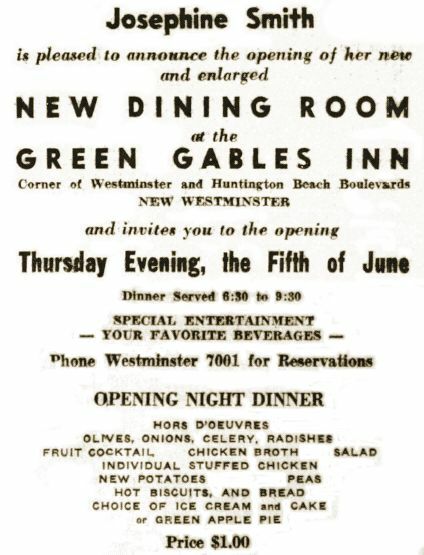 The Green Kat began as the Green Gables Cafe, built at the southwest corner of Beach Boulevard and Westminster Boulevard in "New Westminster" in the late 1920s or the early 1930s. New Westminster, was a highway town composed of about 10 subdivisions developed about a mile east of “old” Westminster between 1927 and 1929. The area was later incorporated into the City of Westminster. On a prominent corner of the highway, surrounded by miles of flat, open fields and few buildings of note, the Green Gables almost immediately became a landmark. "It was very well known in the early years," said Westminster historian and former mayor Joy Neugebauer, "because it was exactly the midpoint between Downtown Santa Ana and Downtown Long Beach. People would use it to give directions." And so it was that Westminster – founded by a minister as a temperance colony in 1870 – ended up with a tavern as probably its most recognizable landmark. The Green Gables appears in the local directories around late 1935, and the first owners were Allen and Marjorie Vorhis (or Voorhees). Along with a service station just across Beach Blvd., its architectural style was an early example of Westminster's spotty Tudor Revival architectural theme. Tony W. Shackles, a charter member of the Midway City American Legion Post, bought the café in Fall 1937. In April 1940, he sold it to easterners Mrs. Jean Reynolds and Mrs. Josephine Smith, although it was primarily Smith who managed the place. She also remodeled and refurbished the dining areas and kitchen and began calling it the Green Gables Inn. Soon after, the Long Beach Independent wrote, "Dancing is on every week night until 2 a.m. Sunday, dancing is from 3 p.m. to 10. 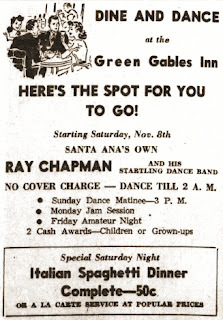 Ray Chapman and his dance band play. Jam session is a feature every Monday, amateur night is every Friday. The popularity of Green Gables Inn is growing steadily as indicated from week to week." In 1941, they were busted for having illegal slot machines. 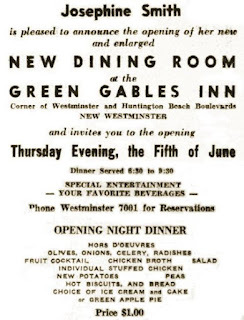 In October 1944 the Green Gables Inn became The Normandy. Mr. and Mrs. Ray Smith of Westminster were the new owners and Harry Greenwood was the manager. By 1951, the proprietors were L. C. Arnold and C. W. Ahlbin. Meanwhile, Orval W. Hinegardner (1910-1991), who’d closed his Green Cat Café and Kit Kat Cocktail Lounge in Santa Ana in 1940, was still ricocheting around the Southern California restaurant scene. This was nothing new for Orval. Even when he was proprietor of the Green Cat, he also operated McNee’s Café on Whittier Blvd. in Whittier, where his father, (Stanton), was the cook and another Hinegardner, (Clifford), was assistant manager. Orval had a penchant for hopping from one thing to another – a trait that probably wasn’t lost on his four (or more) wives. Later in the 1940s he would live in El Monte (no wife listed in the directories), and worked at the oddly-named Hi-Knees Party House in Monterey Park. From the Register, Nov. 7, 1941. I would pay to see a "startling dance band." But in 1952, The Normandy became the Green Kat Café, and Orval – now living in sunny Corona del Mar – was the new owner. 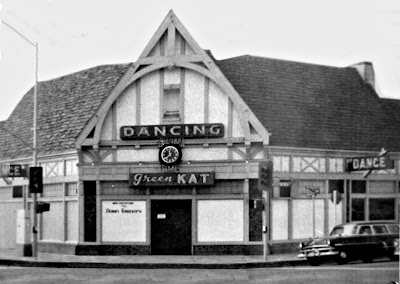 Unlike Santa Ana’s Green Cat, which had once held a fine reputation even among Orange County’s civic leaders, Westminster’s Green Kat was a less-reputable tavern. It appears Orval wasn’t too hands-on this time. The new Green Kat was managed by "Jeanne" (according to newspaper ads) and by custom motorcycle genius/hellraiser Herk Currie. "It was the most popular night spot in the area," said Neugebauer. It was a landmark, but was also a pretty rough-and-tumble place and a mildly notorious as a pick-up bar. But it was also, in the words of Nick Popadiuk, "the crown jewel in the string of watering holes along Westminster Blvd. during [the town's] classic Dive Bar Era (late '50s-60s) ." Soon, Orval and his wife Lorene moved to Midway City, not far from the café. And they added a new family member: a young female chimp named Sara Heartburn. When she was 13 months old she was found to be anemic, and Garden Grove veterinarian Dr. Stanley L. Baldwin performed a blood transfusion from Chester, a chimp from Long Beach. "The transfusion between chimpanzees may be unique in the annals of veterinary medicine," said the Long Beach Independent. 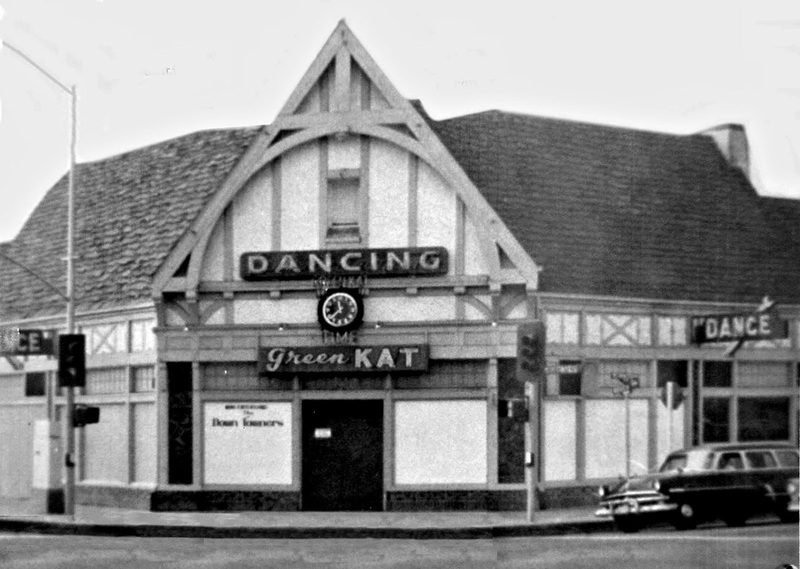 In 1962, the Green Kat was torn down and replaced with future Orange County Supervisor Ron Caspers' Keystone Savings & Loan -- a building that made dramatic use of the Old English half-timbered look suggested by the city's name. Caspers' story -- from his meteoric rise in business and politics to the day he disappeared at sea – is far more interesting than that of the Green Cat or Green Kat. But that’s a tale for another time. Who took the first photo in this post? Thanks to a some re-editing, the photo to which you refer is now the LAST photo in the post. Anyway, that street scene came from old County of Orange Road Dept. records. It was taken in order to document work either done or planned for that stretch of road. It comes from the vast photo collections of the Orange County Archives (www.ocarchives.com). The Green Kat had a dim light lit in a window upstairs from the tavern. The rumor was that it was a brothel where patrons could take there ladies after having a few drinks. Of course, I was in high school at Westminster High at that time where our very active Testosterone minds would go crazy with imagination!! Come to where the flavor is,... Mission Viejo!